Condition upgraded to 'stable' one day after shootout, Soroka Medical Center says. 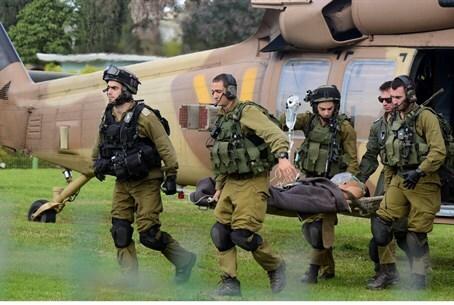 The IDF soldier critically wounded in an exchange of gunfire between the IDF and Palestinian Arab terrorists along the Gaza border Wednesday has made a slight improvement, officials at the Soroka Hospital in Be'er Sheva stated Thursday morning. The soldier's condition has stabilized, they said, and he is now conscious. The soldier is being treated in Soroka's Intensive Care Unit until his condition improves further. Troops were guarding work on the security barrier with Gaza in the vicinity of Kibbutz Nirim and Nir Oz, to the south of the Hamas stronghold, when they came under fire in the attack. After being shot at, soldiers returned fire at the sources of the gunfire. A heavy exchange of fire ensued, during which Tayseer al-Ismary (33), head of the surveillance unit in Hamas's "armed wing" Al-Qassam Brigades, was killed, according to local medical sources, and two other Gazans were wounded.